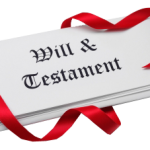 In a will, a person or “testator” expresses, in writing, what he (or she) wants done with his property after he dies. Most states require wills to be signed by the testator and witnessed by two people. “Probate” is a court proceeding in which final debts are settled and legal title to property is formally passed from the deceased person or “decedent” to his heirs. Probate proceedings take place in the probate court or surrogate court in the county of the decedent’s legal residence at the time of his death. If a person dies “intestate,” meaning “without a will,” state law determines how to distribute his property. A trust is a relationship in which property is held by one party for the benefit of another. A trust is created by a settler, who transfers some or all of their property to a trustee. The purpose of the trustee is to hold the property for the trust’s beneficiaries. Trusts are one of the most important innovations in property law. When an owner places property into trust, they turn over their bundle of rights to the trustee. This is usually done for tax purposes or to control the property and its benefits if the settler is absent, incapacitated, or dead. Trusts are most frequently created in wills, to define how money and property will be divided among the beneficiaries. A probate is a legal document, the receipt of which is the first step in the legal process of dealing with the estate of a deceased individual. Receipt of probate resolves all claims and distributions of the deceased individual’s property under a will. Estate and trust planning is the process of using professional advisers or lawyers who are familiar with your goals, concerns and assets to organize your estate and/or set up your trust. Estate lawyers can assist with estate planning, which covers the transfer of property at death as well as other personal matters. An attorney can assist you in choosing beneficiaries, planning for the care of your children, or even making arrangements for your funeral. If you choose to create a will or trust, consulting with an attorney experienced in estate planning is always a wise thing to do. Drafting a will or trust can be difficult, and the help of a professional can be crucial. The potential tax implications and legal formalities of will and trust drafting make a lawyer’s counsel indispensable. A lawyer can explain all your options and help you understand what types of wills or trusts are right for you and your family. Estate administration is the process of maintenance and distribution of assets after someone dies. This is done in agreement with either the will of the decedent (person who died) or state law. An experienced estate lawyer will follow the terms of the drafted will and explain all available options to the involved beneficiaries. The person appointed to administer the estate may have tax or legal questions that need to be answered by a lawyer or tax professional. An experienced estate lawyer will know what to do, and help guide you through the legal process. Only an estates and trusts attorney who regularly practices in the fields of wills, trusts, probate and estate planning is able to provide you with really sound legal advice as you put your estate plan into place. Attorneys who specialize in estate planning will know the most current tax laws and help you get the most money to your heirs. Often the expense incurred in retaining an attorney to prepare and help you put an estate plan into place is worth hundreds of times what you and your family might pay in taxes with no planning. Contact LegalHelpLawyers.com today to get expert legal assistance with an estate, will, or trust!